Every Tuesday, a procession of hundreds jogging and walking in brightly colored athletic gear makes its way south on Cascade. It's puzzling if you aren't in the know. These folks are participating in the weekly Jack Quinn's running club. President John Finke says the run began ten years ago, and over 30,000 people have participated since. "Fitness here is big," Finke says of the running club. "We have runners, bikers, hikers. So we all meet, and a lot of stuff goes on here. One lady got her 100th run shirt after losing 100 pounds. Motivation." Jack Quinn's is just one of the multiple running clubs throughout the city. One list names at least 20. Add in the Manitou Incline, climbing gyms, cycling clubs, the seemingly burgeoning local sports medicine field, and the citywide trail system, Colorado Springs has a reputation for being a place where fitness is everywhere. This year, Colorado was once again named the leanest state in the nation. The city touts being called "Number Two Fittest City" and "Third Top Sports Town" by Men's Fitness magazine: just two of many similar titles from various publications. Mayor John Suthers emphasized the city's Olympic sports influence in his State of the City address in early September. "With the addition of the Olympic training center, 23 national governing bodies, and soon, the United States Olympic Museum and Hall of Fame, we have become the center of the Olympic movement in the United States," Suthers said. But, according to some, the city has a long way to go to become truly fit. Mina Liebert is the public health planner for the county's health department. "One out of every two Coloradans are either overweight or obese, and the demographics are very similar for our state and in El Paso County. And then one out of every five are obese," Liebert says. She says El Paso County has seen a dramatic change. "The prevalence of obesity has gone up significantly," she says. "In the last 20 years, it's more than doubled." 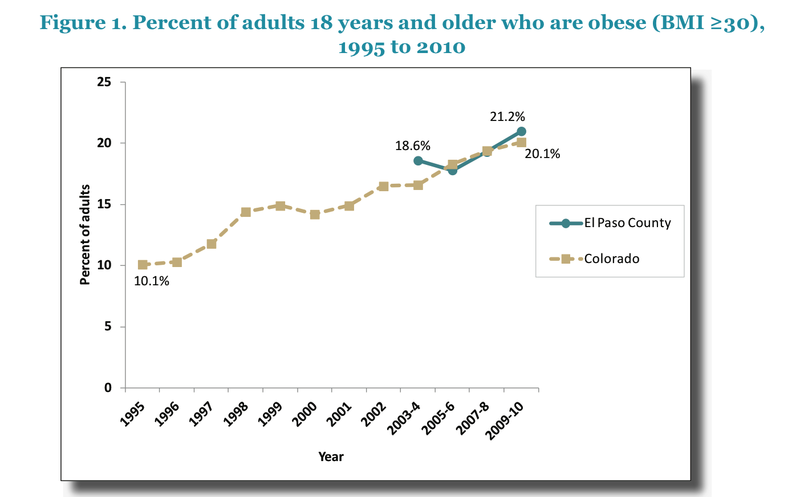 Obesity rates doubled in El Paso County between 1995 and 2010. Many people picture morbid obesity when they hear these statistics. But Liebert says obesity can mean being just 30 pounds overweight, so that includes more Coloradans than most think. Dr. Erik Wallace directs the Colorado Springs branch of the University of Colorado School of Medicine. He says obesity can cause other health issues. "Obesity leads to higher rates of hypertension, higher rates of diabetes, which can lead to higher rates of heart disease and stroke," he says. According to the most recent El Paso County Health Indicators Report, rates of non-gestational diabetes, high cholesterol, and hypertension in the county all rose between 2003 and 2009. That 2012 report also shows obesity and poverty are likely linked. Among adults in El Paso County who make less than $25,000 per year, obesity rates are generally higher than other income levels. Dr. Wallace says poverty comes with environmental challenges that can affect health. "Those who live in poverty tend to live in neighborhoods where they have less access to affordable, high quality food and less ability to get out in a safe neighborhood and be able to exercise and get out and about," he says. Data indicates while Colorado may have the lowest obesity rates in the country, it doesn't measure up so well in other health indicators, such as physical activity and kids' health. Many are working to combat obesity statewide, including Gabriel Guillaume. He's on the leadership team at Livewell Colorado in Denver, an organization dedicated to promoting healthy living. "The fact that we're 24th in the nation in the physical activity levels of our youth is pretty extraordinary given how our image in the state is one of much stronger health," he says. That statistic comes from a 2015 Colorado Health Foundation report. Guillaume points to a pattern of fit adults migrating to Colorado, not growing up here. As for El Paso County, more than a quarter of all children aged 2-14 are overweight, according to the health department report. That's about three points higher than the overall state rate. In Colorado Springs, Jacqueline Dugan ran the Jack Quinn's Run for the second time. "I was really surprised I could do it the first time!" she said. "But I figure if I could do it once, I need to keep trying until it gets easier." Liebert says that the El Paso County Health department, through the new Healthy Community Collaborative, is working to partner with other community organizations to promote healthy, active living. The Collaborative has a goal of stopping the upward trend of obesity by 2018. Note: Jack Quinn's is a 91.5 KRCC underwriter. 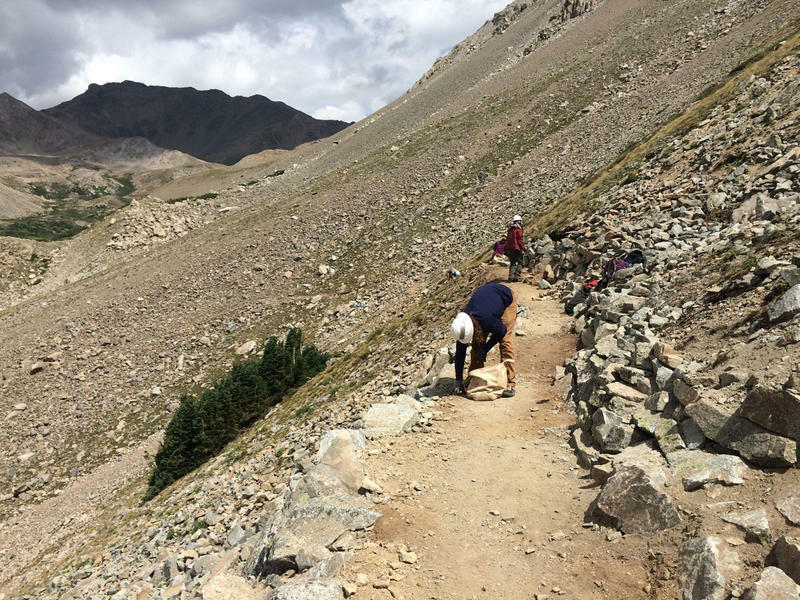 91.5 KRCC's Dana Cronin climbed a couple 14ers to report on the work it takes to maintain them. Colorado is known for its iconic 14,000-foot peaks, more commonly known as fourteeners. Despite their majestic appearance, these high peaks have a fragile ecosystem and it takes a considerable amount of effort to keep them in good condition. The season is over now, but for about five months of the year, crews work to create and repair trails. Colorado is receiving a $12 million grant to assist youth and their families with serious mental, emotional, and behavioral issues.